Sometimes it is necessary to kill in order to complete the act of hunting. 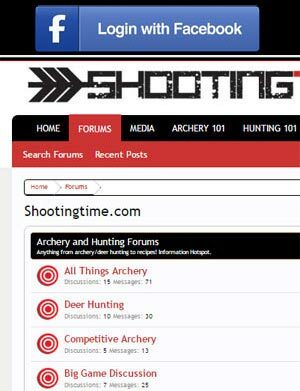 Every bow hunter “hunts” far more that he “kills”. That is why when it comes time to “kill” the animal you have hunted, a hunter has the obligation to do it well. By well, I mean quickly and accurately. Because we are bow hunters, a lot of variables go into the act of “killing”. Including but not limited to practice and equipment choice. Practice falls on the shoulders of the hunter as does equipment choice. It goes without saying that shot placement is the paramount factor when it comes to a quick kill. Nothing replaces a well-placed arrow. Some bow hunters will argue the only broad head to use is an expandable with a two inch plus cutting diameter. I understand the attractiveness of a two inch wide swath through the vitals of your quarry. However, there have been far more deer effectively taken with two blade broad heads than with modern mechanicals. Native Americans used by our standards, dull, small, ineffective heads on their wooden shafted slow longbows with great success. Why? Because they had good shot placement. If the Native Americans did it with primitive equipment, why do we need to rely on a mechanical broadheads? I am not saying there is anything wrong with large expandable broad heads. However, what does bother me are the “hunters” who rely on the effectiveness of their magical, broadhead in lieu of good old fashioned practice. I do believe that most of today’s broad heads will kill an animal if placed correctly. Don’t take what I have written as a slam against users of mechanical broad heads. I know competent archers and hunters whom I respect that swear by them and always use them. 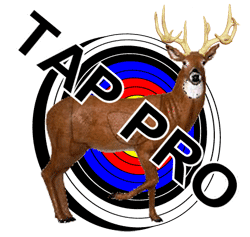 Those archers and hunters will also agree that practice and shot placement are the key, not the broadhead. That being said, I am unapologetically old school and have been that way for a long time. When I was in high school my buddy Chris used to tell me I was sixteen going on forty. I just like things simple. I don’t want to rely on screws, O-rings, and or blade pressure for a piece of my equipment to work when not necessary. I practice frequently and keep my archery tackle tuned and accurate. I try and put myself in the best possible position to be able to connect when the moment of truth arrives. It is MY responsibility to be prepared and to quickly kill the animal I hunt. After all, if I am going to take the life of an animal, the least I can do is kill it with the least amount of suffering possible. It is just the right thing to do. I obviously prefer fixed blade broadheads. I just like the simplicity of them. They are not magical, just simple. Sharp metal objects that will slice heart and lung tissue and hopefully break bone if necessary. First and foremost, they must fly well. I do not care how much cutting surface the broad head has. If it is not accurate, it is useless. I have used several fixed blade broad heads over the years. Some of the broadheads I used and killed white tails with are Sonic, Trophy Ridge Bunker Buster, Muzzy, Steel Force Phat Heads,Rocket Ultimate Steel, and Slick Tricks. 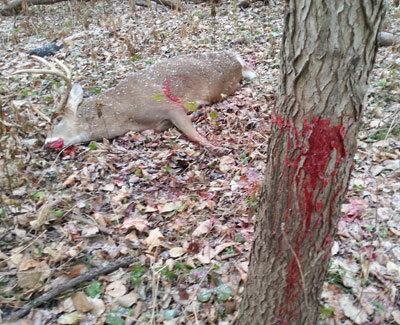 I have seen deer fall in sight with all of the above mentioned broadheads. Of all the broadheads I have used, I am impressed by the Slick Trick broadheads the most. I like the tough compact design of the Slick Tricks. They are a four bladed broadhead with a steel ferrel. The blades lock togehter inside the ferrel. This gives a “four” blade broadhead with only two actual blades. When shot, they fly very well and group with field points. I have never had one break. Sometimes the sharp edge of the blades will wrinkle but I think that is unavoidable. I usually just touch up the blade with a file and or a sharpening stone and back into the quiver it goes. I have also purchased replacement blades after a couple of deer. 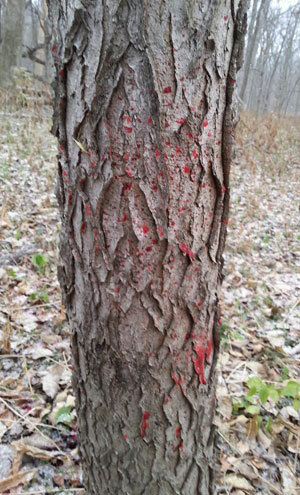 I have seen amazing blood trails from Slick Trick broadheads while tracking whitetail deer. 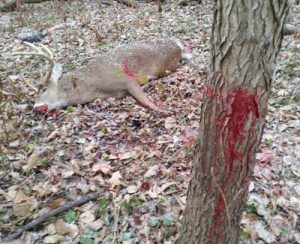 Do I think Slick Trick broadheads are the only broadhead worth shooting? Absolutely not. However, I have shot a lot of deer with them. In fact a few of the deer have been shot with the same broad head. I use them for Illinois whitetail and it was my broadhead of choice for elk in Colorado. I wish I had a success story to share about an elk! I do not but it was not the fault of the Slick Tricks. I did not get a chance to “evaluate” the Slick Tricks on elk as I did not get a shot. We will just call that “hunter error”. Tune your bow, properly match your arrows, and practice. 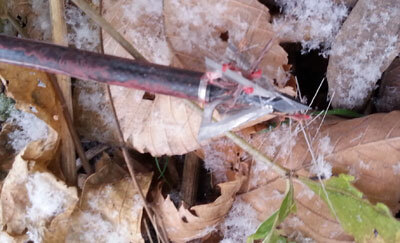 Then give Slick Trick Broadheads a try, I think you will be pleased. 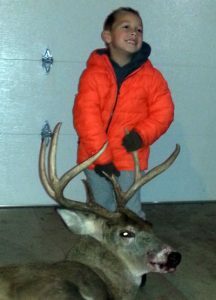 John has been an avid hunter seen he was 12 years old. Although he hunts a variety of animals, bowhunting whitetail deer is where his passion lies. John is married and has a son Jake who he loves taking with him in the field. "Raise em right. Discipline learned in the field can translate to success later in a child's life."